For the 10th semester, a special group of seventeen Umbra students are taking all of their classes during their semester in Perugia at the University for Foreigners, one of the oldest and most prestigious Italian language schools in the world. The University, or Stranieri as students in Perugia generally refer to the school, opened in 1921 as a language program within the University of Perugia, and classes were held in the Sala dei Notari at the Palazzo dei Priori — the very room where Umbra holds our welcome orientation meeting for all students at the beginning of each semester. The impressive Palazzo Galenga opened in 1926 as the primary seat of the Universita, with a large library, frescoed classrooms, and incredible views out across the valley. Over ninety years later, several thousand students from all over the world come to Perugia each year to take intensive immersion courses to improve all aspects of their Italian language skills. Our seventeen students studying at Stranieri arrived in Perugia several days ahead of the general studies students for their own orientation to Perugia, and during the semester they will meet with Umbra professors for weekly tutorial sessions. These meetings will be especially helpful this semester since the current group has embarked on a particularly challenging course of study. In boca al lupo a tutti! 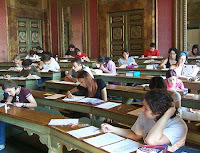 For more information, check out Stranieri’s website: http://www.unistrapg.it/english/.